"Dr Wang and his staff are the best! I've never had such a great experience at a dentist." "Everything is super hygienic and comfortable, and all staff is genuinely a pleasure.."
"Best dental facilities I've been to! It's personal, friendly, quite, and professional." "Quick, thorough and the dentist's manner set me at ease." "I've been visiting Dr. Wang for more than 5 years and have always found him to be kind.."
"Madison Square Dentistry by far has been the BEST Dental office I have ever been to." Above all else, Lawrence Wang, DDS and his skilled team of dental professionals at Madison Square Dentistry, located in New York City, care about patients and their smiles. Dr. Wang uses comforting amenities and advancements in dental technology to provide premium service and treatment. Dr. Wang, a graduate of the New York University College of Dentistry, completed a residency in general dentistry and a fellowship in implant dentistry. He is a member of the Academy of General Dentistry and the New York County Dental Society. Providing state-of-the-art dental treatment, Dr. Wang and his team specialize in preventive dentistry, restorative dentistry, cosmetic dentistry, and periodontal (gum) health. Whether you need teeth whitening, fillings, crowns, bridges, removable braces, or gum disease treatment, Dr. Wang helps you make informed decisions about appropriate care. 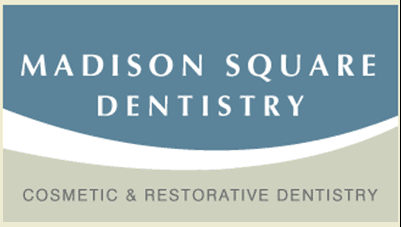 Manhattan-based Madison Square Dentistry offers you a warm and welcoming atmosphere. You can even cover up with blankets, watch television, and enjoy the scent of aromatherapy during visits! Dr. Wang and his team care about your smile, and they make each trip to the dentist an unforgettable one. Time will fly by while you’re watching a movie or your favorite show while we work. Your visit will be over before you know it! If you arrive early for your appointment, treat yourself to a cup of coffee, cappuccino, latte, hot chocolate, or an ice cold bottled water. Drown out the noise of the office and enjoy your favorite song or artist with headphones to help you relax. Freshen up after your appointment with a warm aromatherapy towel. You’re sure to leave our office feeling revitalized. First and foremost, we’re committed to patient safety. Our procedures and office cleanliness meet or exceed the American Dental Association (ADA) and OSHA recommended standards for clean and safe dental practices. We have a sterilization area where every instrument is wrapped and disinfected prior to your visit. We also sanitize our treatment rooms between patients. Additionally, we perform weekly spore testing with a third party infection control center. You can take comfort and confidence in our care! Even healthy, strong smiles need a little maintenance now and again, and we make it a priority to perform the most effective, least invasive treatment possible. Regular, conservative care not only saves you from more extensive (and expensive!) dental work in the future; it also keeps your visits to our office short, sweet, and worry-free. So if you’re looking for a modern, welcoming dental practice that puts you and your needs first, we invite you to come in and discover the Madison Square Dentistry difference! With 6 Month Smiles® short-term braces, Dr. Wang can help you get the straight, beautiful smile you’ve always wanted—in less time than you ever thought possible! LANAP® is the first and only FDA cleared laser protocol on the market for fighting gum disease. The laser surgery's ability to kill the bacteria that causes gum disease is backed by both domestic and international independent studies. LANAP® can save natural teeth that otherwise would require extraction by promoting bone regeneration. LANAP® saves teeth, reduces pocket depth, and regenerates bone growth to achieve optimum periodontal health. And now, Madison Square Dentistry is offering this advanced laser gum surgery in Midtown Manhattan, NY. "I tend to be extra sensitive for certain procedures and they went above and beyond for my treatment and they were very accommodating with my schedule." "I adore Dr. Wang and his staff. Always friendly and helpful, and delighted when you take an interest in your care." "Dr. Wang and his staff are TOP-NOTCH and AMAZING! Top-notch because they do excellent work and my teeth always leave feeling squeaky clean!" "I have gone to around 5 dentists in my life and NONE of them compare to Dr. Wang. The experience was so pleasant I hardly realized I had been to the dentists." "Dr. Wang always lets you know what he is doing before he does it. Also he is extra considerate in making sure that you don't feel any discomfort during your cleanings!" "The whole process...was handled efficiently and with the greatest professionalism, without the feeling of being too clinical or rigid." "He is careful not to do anything without telling you first, you can tell that your comfort and safety is his foremost concern." "The office is great, the whole staff is professional, they run on time -- I don't think I've ever even sat down once in the waiting room."